This is the old hangman game. I originally completed this game a couple months ago and was delaying the release because I wanted to make it so the user could select from multiple dictionaries on the Internet, but I've been way too busy lately so here it is. I created this dictionary by going to some web pages and cut and pasting words into another computer program I wrote that created the data file. For a more modern version check my Android/iOS page. You can use 2,4,6,8 or the joystick pad on your phone if you have one to move the cursor around. to select a letter press ok on the joystick pad or the number 5. The object of the game is to guess the hidden word by picking letters to spell it. If you pick a correct letter, the "-" where the letter is supposed to be will be replaced by the letter. If you pick a letter that is not in the word, another part of the hangman is drawn. 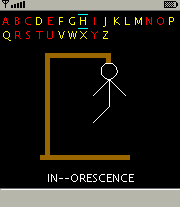 If the whole hangman gets drawn before you spell the word, you lose. To exit this game, you may have to hold down the back button on your phone.